We Defy Augury: Big Boi (feat. 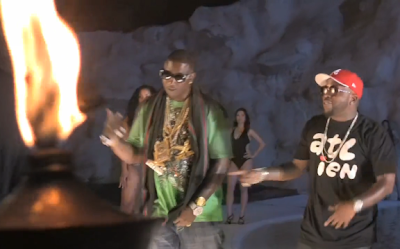 Gucci Mane) - "Shine Blockas"
Off the forever delayed Sir Luscious Left Foot. First time I've really listened to Gucci Mane. According to MTV, the #6 Hottest MC in Hip-Hop right now. Mane's got a pretty good mixtape and some bumpin singles. Speaking of Shine, i believe Shyne was supposed to get out of jail this week on those charges Puffy put on him. He's being delayed cause he might get deported. His father is the PM of Belize. As for the list, you can't put Drake above Wheezy. Why is 50 there? Gucci Mane is too high cause they needed someone from the south other than Wheezy (since he's way bigger than the south now). I like Rick Ross and I have no idea what he did to deserve to be on this list. What has he done that's "hot"? I understand that this is supposed to be who's hot right now, but I simply can't respect a top 10 ten list that doesn't have Lupe on it. haha, c'mon Eric, quit delegitimizing your blog!